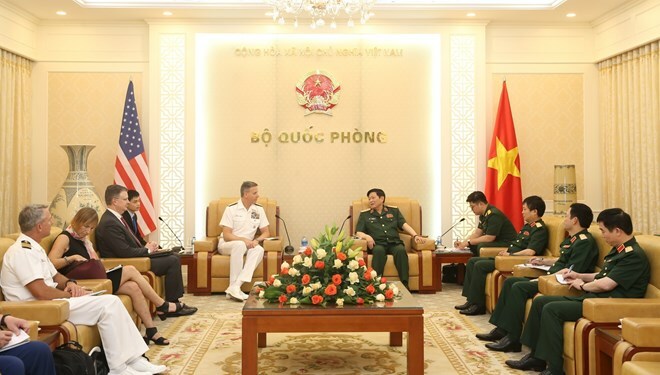 Hanoi (VNA) – Defence Minister General Ngo Xuan Lich met Commander of United States Indo-Pacific Command (USINDOPACOM) Admiral Philip Davidson in Hanoi on April 16. Admiral Philip Davidson is on a working visit to Vietnam. The US commander congratulated Vietnam on its successful organization of the second Summit between the United States and the Democratic People’s Republic of Korea in late February, 2019. He informed host of the outcomes of his talks with Chief of the General Staff of the Vietnam People’s Army and Deputy Defence Minister Senior Lieutenant General Phan Van Giang. General Lich hailed the outcomes of the talks and said together with their comprehensive partnership, the two countries’ defence cooperation has been growing soundly, as evidenced by the exchange of visits, training, the sharing of experience in UN peacekeeping activities, and the addressing of war consequences.